Although a gin tonic is the drink to order nowadays in Barcelona, I have never been a big fan. It all comes to choosing the right gin, apparently, but the standard selection in an average bar has never convinced me that much. So when my friends took me to Rubi, I ignored their “best gin tonics ever” and stubbornly ordered a mojito. But then I saw the wall behind the bar. Rubi is not just any gin-tonic bar; they brew their own gin! Many bottles with different flavoured gin are on display and you name it; they have it. 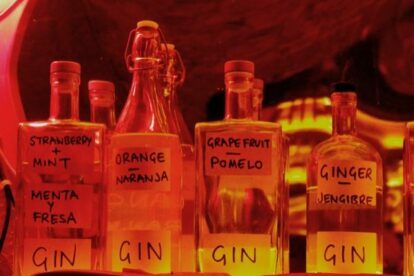 Depending on the season of course, but what would you think of chocolate/orange gin or blood orange gin? I got curious and my friend ordered a grapefruit gin. I took a sip….and I was sold on this bar. Apart from the great selections of gin my mojito was delicious too and came at a great price. The bar is cosy and small and off the beaten tourist path; in one of the small streets in Born. The bartender told me the most popular drinks are for example Strawberry Mint or Strawberry Balsamic, but find your own favourite as there are many! So if you are a gin lover and want to try something slightly different; Rubi is a must do on your Barcelona trip!